Since the advent of the web and its break into the mainstream user market somewhere in the fuzzy early 90s, the landscape of websites out there has evolved in a manner that ‘radical’ woefully undersells. Multiple reincarnations and reinterpretations of what a website is, what it does, what it looks like and how you should interact with it have come and gone, each building upon the last technologically but always reinventing itself aesthetically to conform to new paradigmatic schemes, digital visual language sophistication and the taste of the times. It has been a long road from the late 90s websites with their tiled textured backgrounds and slow-loading GIF-laden, saturated and baroque layouts. Long gone are the days of the dancing baby GIF, and with the latest and greatest incarnation of the web, in the form of the new HTML5 framework, the graphical standards of the web have once again been raised to match the power of new technology. With modern screen sizes and resolutions being vastly powerful enough to handle the subtle detail of a minimalist design, and modern audiences being visually refined enough to easily navigate their way around minimalistic digital visual languages, this is the era of less is more. The following collection of HTML5 templates are among the most refined and polished minimal templates around. 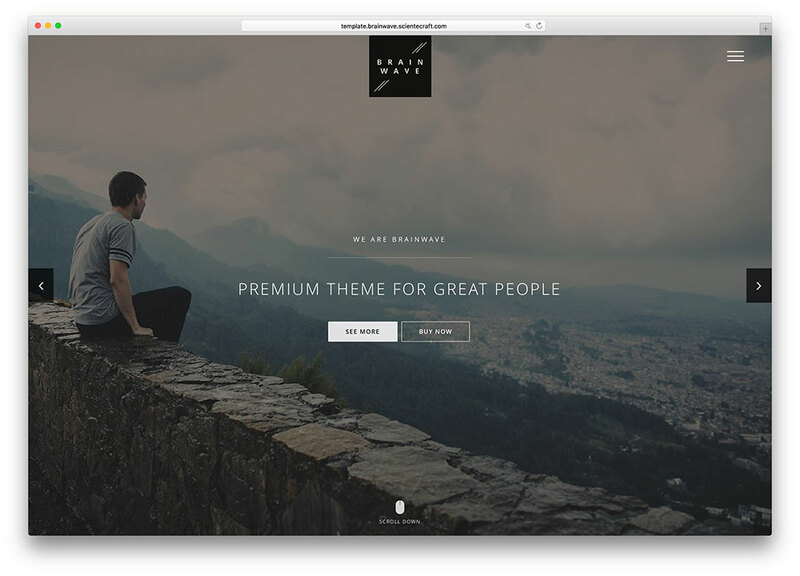 Stash is an incredible and versatile WordPress theme. It has a clean, flexible and minimalistic design that can adapt to all kind of uses and users. You will get it focused on typography, display and usability. It is compatible with Contact Form 7, Google Fonts and comes with a Font Awesome icon pack. Stash includes premium plugins like: Visual Composer, Slider Revolution and Essential Grid. You can create and adapt any type of layout and multimedia upload using this mix! Stash lets you play with MegaMenu options and set multiple layout formats. You will get 260 page builders blocks, 48 homepages and more than 80 page elements! It is also translation ready through files and compatible with WPML. Stash offers you 15 inner pages and 7 pre-built portfolios to showcase from. This is by far a unique tool though for both professional and personal websites. You will be able to choose between a big variety of minimalistic icons. Stash is SEO ready and was optimized for speed. With its retina ready quality and responsiveness it is cross-browser compatible. Have a look! Its documentation is clear and concise and has a wonderful support team ready to help! Just look it up and try it out! Try Stash! Pages is an amazingly fresh-faced and clean, visually well structured and highly intuitive, spectacularly strong and well-built, incredibly reliable and secure, advanced and minimal HTML5 website template, a thoroughly developed and wholly impressive template that has been put together with the utmost attention to detail and the most polished and cutting edge web technologies available in order to create a template capable of serving as a remarkable frontend to no end of website archetypes. That is because Pages has been built on a potent and solidly programmed HTML5 framework, capable of handling the most diverse of tasks and graphical requirements, and coupled with a uniquely profound capacity for customization, presented through a responsive, block-based visual design and customization process that involves absolutely no coding at any point and can empower webmasters of any skill level to quickly and effortlessly churn out all sorts of polished, minimalist websites with an advanced edge that will certainly engage and fascinate your audience. Pages is also available as a dashboard, where you will find yourself overwhelmed with the powerful and instantaneous customization options offered to you. The Pages frontend is also entirely responsive out of the box, ensuring no visitors miss out on your precious content. 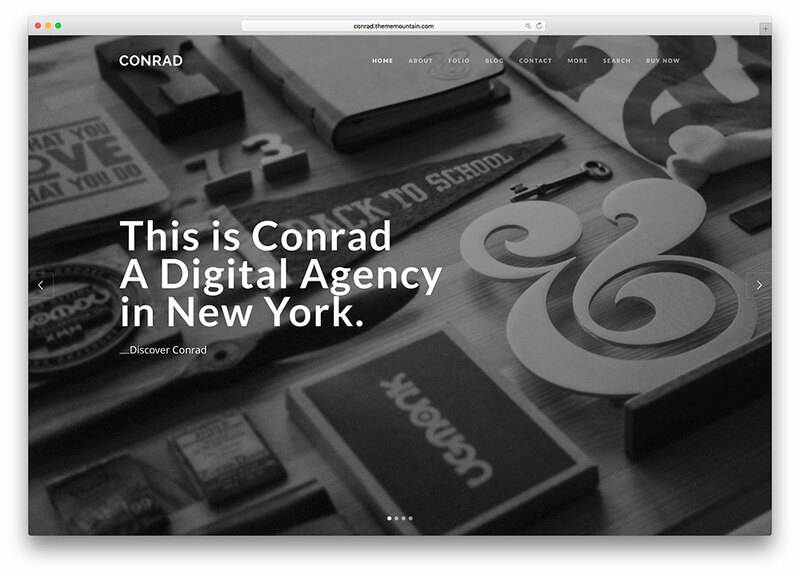 Conrad is a developer friendly, incredibly vast and expansive, carefully crafted and masterfully designed, graphically versatile and polished, sophisticated and functionally profound, minimal HTML5 multipurpose website template, a delightfully inventive and entirely thought out template. It is a polished and cohesively coded template that has been deliberately packed with the sheer strength to muscle the demands of a slew of diverse website needs, as well as the visual sophistication and tech-savvy resourcefulness required to seamlessly adapt itself to all sorts of design configurations with utter elegance. Conrad has been constructed keeping in mind the importance of content in this interactive age, and Conrad’s uniquely minimalist, distraction-free and highly focused graphic design philosophy is both very innovative and cutting edge as well as extremely intuitive and user-friendly, requiring little to no adjustment for users accustomed to modern mobile and desktop application environments. Conrad’s creative, minimalist design is inherently responsive out of the box, and you can easily build your own unique pages using over 25 layouts and content blocks and over 20 customized components contained within Conrad’s own Timber framework, a block-based visual page editor that empowers webmasters of any skill level to no end. Conrad is the real full package! Enigma is an incredibly creative, wonderfully elastic and pliable, visually fresh-faced and clean, highly vibrant and graphically bold, technologically capable and functionally powerful responsive HTML5 creative minimal website template, It is an elegant and deeply stylish website template that has been thoughtfully developed and well programmed to be an efficient an impressive set of tools for producing wonderful, gorgeous and extremely resourceful websites built on top of an HTML5 framework. Enigma incorporates the latest CSS3 and Bootstrap technologies, deploying them to great effect in both visual and backend terms—while CSS3 renders your animations smoothly as well as keeping your aesthetics dynamic and light, Bootstrap turns HTML5 into a modular, developer friendly codebase, and simultaneously makes Enigma websites natively cross compatible across all known platforms, devices and browsers. Enigma includes ten different, polished and professional looking Homepage demos that can be readily imported for your convenience and greatly speeding your workflow, while features like the Hero Video Background keep your website engaging and interesting with minimal visual disturbances and no clutter. Enigma includes the jQuery Slider Revolution plugin, for impressive and beautiful sliders with no coding required whatsoever. The real mystery here is if there really is a limit to Enigma’s power. Find out for yourself! Haswell is an incredibly comprehensive, wonderfully thoughtful and amazingly convenient, developer and user friendly, intuitive and well-structured technologically sophisticated and highly advanced responsive HTML5 one page and multipage multipurpose website template. It is an extremely thoroughly developed and reliably coded template that is packed to the brim with a whopping 118 completely predesigned, preconfigured webpages convenient for all sorts of different website applications and usages, from modern and flexible single page websites decked out with custom built widgets to fully fleshed out multipage websites. Haswell comes with all sorts of timesaving pages and features preconfigured, Haswell can handle them all, with an understated, professional and soft-spoken nature that lends itself perfectly to business or personal applications, as Haswell visually stays out of the way out of your content, providing a beautiful and responsive blank canvas for your work. Haswell deploys the latest HTML5 technology beautifully and intuitively through a simplified webpage building process, from header selection to a block-based stacking process for sections and content, to footer selection, and done! Haswell can churn out endlessly vast websites within minutes, regardless of your skill level, without programming a single line of code. Over 350 functional blocks are included. Haswell is a truly outstanding, all-inclusive package. SPOONS is a completely gorgeous, visually appealing and profoundly engaging, entirely hip and modern, technologically proficient and professionally graphically designed, resourceful minimal HTML5 single and multipage multipurpose website template, a clean and minimalist website solution packing an impressive 100+ preconfigured layouts within, each equally unique and creative while elegant and understated. SPOONS is built atop the flexible and potent Neko Framework, a splendidly reliable and delightfully intuitive toolkit that speeds and eases the website building process to no end, running atop a sophisticated HTML5 foundation which integrates Twitter’s Bootstrap modular design and an easily customizable, amazingly smoothly animated CSS3 visual environment. SPOONS balances these elements with utmost care and attention to detail, while remaining an unobtrusive graphical scaffolding for your content to get all the attention, with no redundant clutter distracting users from your precious works. SPOONS includes a wealth of Retina-ready, fully fleshed out demo websites, in both one page and multipage presentations, which permit webmasters of any skill level to hit the ground running and effortlessly produce dozens of completely polished webpages within minutes. 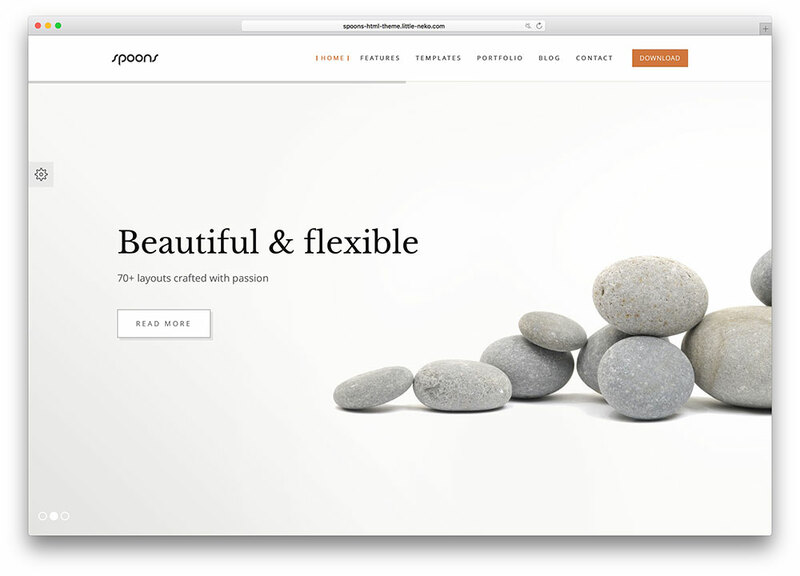 SPOONS websites are inherently responsible and mobile friendly, owing to their Bootstrap codebase, and search engine optimized to boot. What else could you ask for? Wolverine is a wildly ambitious, visually understated and engaging, elegant and vibrant, colorful and well designed, modern and intuitive, simplistic and aesthetically minimalist, thoughtful and warm responsive HTML5 multipurpose website template, a uniquely constructed and vastly flexible website template that combines the most gorgeous and well developed visual elements available with the cleanest and most well-structured layouts around to produce a template that empowers webmasters of all kinds and backgrounds to effortlessly create impressive and remarkable websites, powered by HTML5 interactive and sophisticated elements styled dynamically with fast-loading LESS CSS3 technologies and a developer-friendly Bootstrap 3 modular codebase that is extensively annotated for easier modification, making Wolverine not just a stylish, hip and fashionable template but a programmer-friendly one. 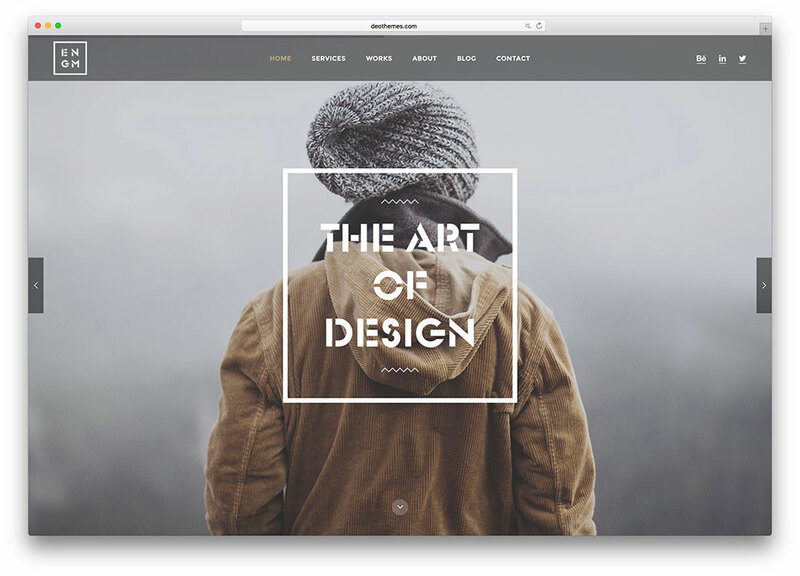 Wolverine is jam-packed with dozens of customized, preconfigured page templates for uses such as Blogs, Portfolios and Coming Soon pages, and incorporates elegant and attractive Parallax background features that will keep your users interested with minimal visual clutter. Wolverine specializes in subtly highlighting your content over a powerfully muted graphic environment that feels both polished and accessible. 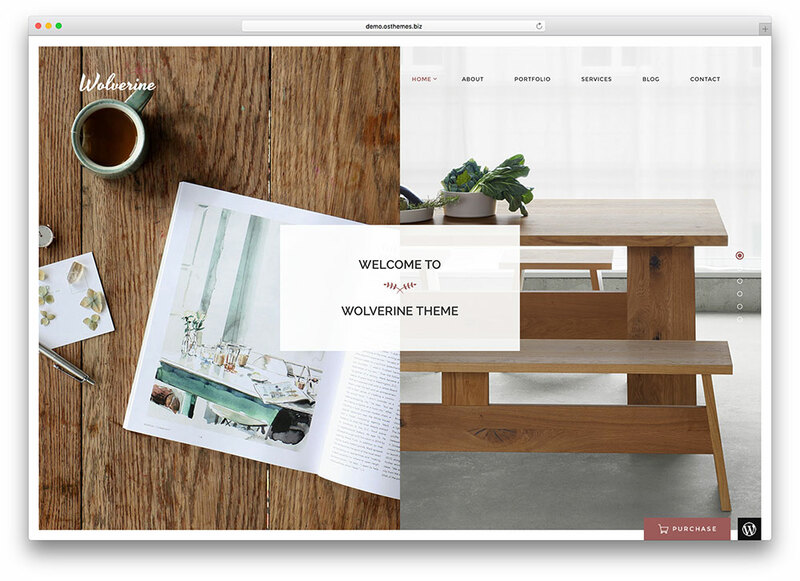 And with easy, visual customization processes, Wolverine is a great blank canvas for you to paint the picture of your dream website. Try Wolverine today! LeadGen is a minimal and responsive HTML marketing multipurpose website template. 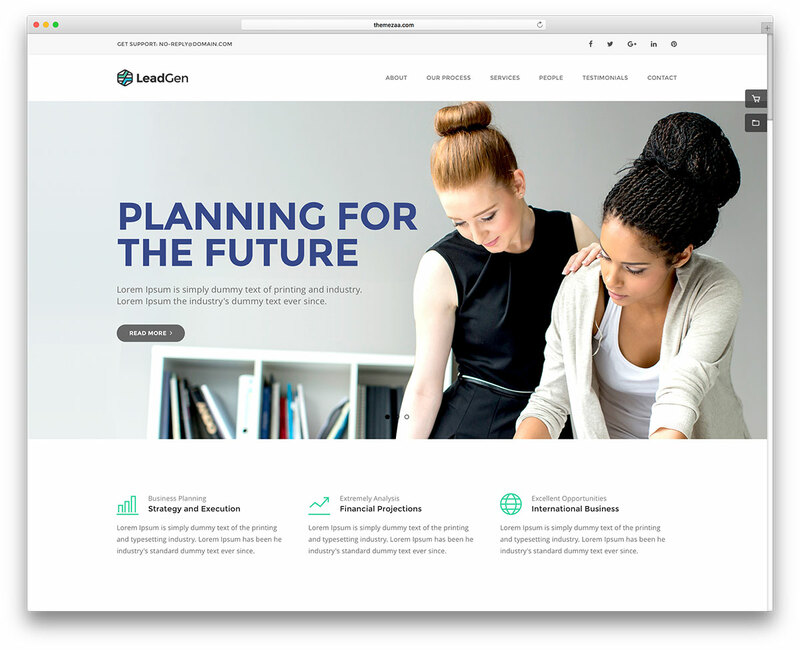 LeadGen provides a clean and crisp framework for building modern websites. With LeadGen, webmasters from all backgrounds can achieve professional results. Deploy masterful modules and elegant elements through an integrated HTML5 page builder. 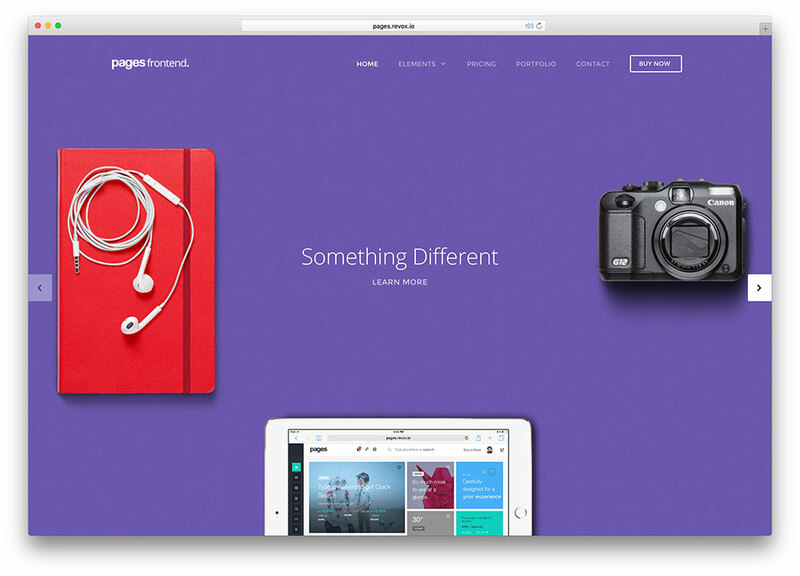 Select from hundreds of options to customize your pages, animations and transitions. 32 sleek demo websites are packed within LeadGen offering solutions for many industries. There’s something for everyone within LeadGen. And what you can’t find, you can make on your own with tons of intuitive tools. With LeadGen, marketing your content to a massive audience is effortless and effective. LeadGen is optimized for marketing conversion, letting your content be the star. 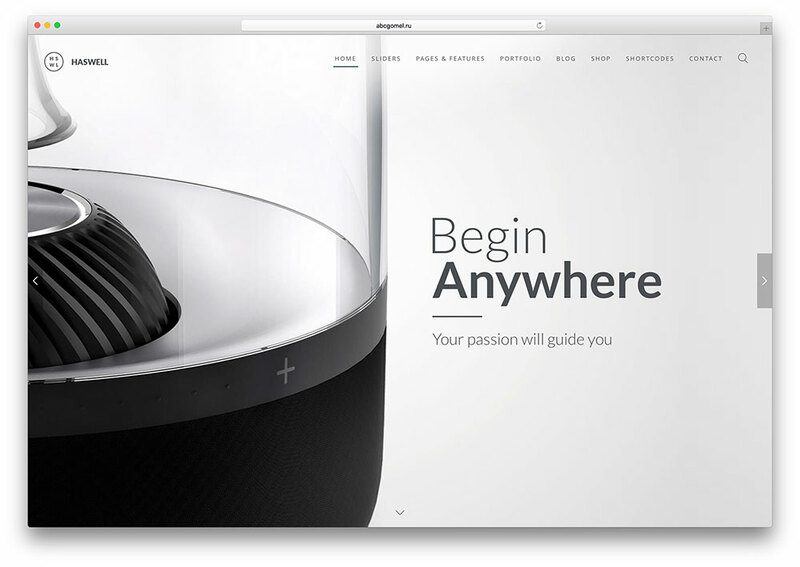 A minimal visual design philosophy makes your marketing more effective. Lightweight and fast-loading, LeadGen’s Bootstrap coding keeps your server loads low. Even under peak traffic conditions, LeadGen outperforms every template on the market. A slender code makes your pages more responsive and reactive, keeping things crisp. LeadGen’s minimal style permeates each of its landing pages and demo websites. You can engage with a broad audience overnight in a seamless style today. Check out LeadGen now, and see what it can do for your project! Brainwave is an incredibly clever, spectacularly resourceful, very well developed and genuinely thought out, comprehensive and thorough, extensively functional and feature-dense responsive HTML5 single and multipage multipurpose website template, a polished and developer friendly template that has been carefully crafted using the latest and greatest web technologies available in a stylish, elegant combination that never fails to impress. Brainwave is built on top of a sophisticated HTML5 framework incorporating a Bootstrap 3 modular codebase and a stylish visual presentation based on SASS CSS3 smooth animations and dynamic stylesheets as well as the Gulp package, which, with Brainwave’s noticeably developer-friendly, cleanly annotated and legible code makes thorough, deep customization not just a possibility, but the norm with Brainwave. Brainwave packs over a dozen different Demo pages and over 23 other different, specific, preconfigured page templates for all sorts of various website needs, such as Blog, Portfolio or About Us. 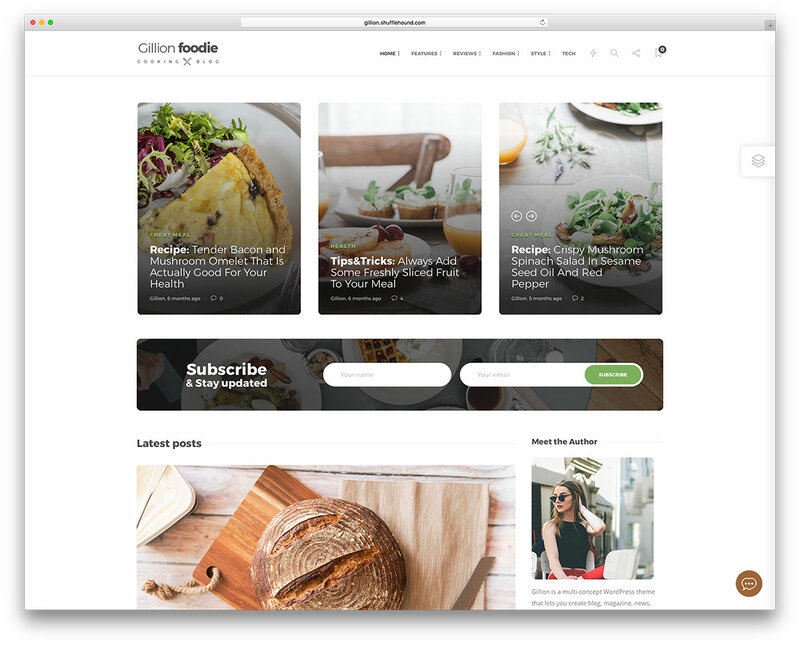 Gorgeous custom menus are built in, as is MailChimp subscription newsletter integration out of the box. Brainwave is extremely easy to visually customize thanks to its expansive customization options, so you can make every page your own with little hassle and optimal speed. Brainwave has also been engineered to be optimized for search engine indexation, so your website will top the ranks. Brehoh is an extremely clean and fresh-faced, youthfully vibrant and energetic, incredibly modern and thorough elegant, simple and easy to use, intuitive and technologically sophisticated, flexible and powerful, vast and ambitious responsive HTML5 minimal one page multipurpose website template, a spectacularly structured template that has been decked out with an advanced set of polished and cutting edge tools and features that enable webmasters of any skill level to easily and effortlessly build sophisticated, aesthetically minimalist and refined websites that look and feel unique and dynamic. Brehoh has the skills to muscle the demands of an ample range of website archetypes across a vast field of industries. That is because Brehoh seamlessly melds the technological proficiency of HTML5-powered Bootstrap modular responsive technology with the elegantly reactive CSS3 styling technology that enables Brehoh to create one of a kind, avant-garde visual designs and effects. Brehoh then deploys this technological might to great effect, applying it to a series of beautifully preconfigured template pages and demo websites that are all clutter-free and wonderfully clean, easily adapting themselves to just about any graphical need you may encounter and always keeping things focused on your content, minimizing distractions. Brehoh is the sharpest knife in the drawer! Marquez is a completely gorgeous, visually appealing and attractive, functionally engaging and very interactive, highly customizable and deeply flexible, clean and fresh-faced, elegant and aesthetically pleasant responsive HTML5 creative multipurpose website template, a purposefully built template with an expressive nature and a deep running functional streak that makes Marquez websites stylistically unique and very recognizable. Marquez is built atop a tough and reliable HTML5 framework running Bootstrap 3 and styled through CSS3 technologies. Marquez is further powered by amazing features and plugins, like the beautiful Avalanche Slider, the premium Summit Lightbox and plenty of other stunning, dynamic and interactive elements to really spruce up your website and augment your audience sizes. Marquez’s unique design is especially built to make content stand out, which it does by deploying a minimalist visual language that is easy and intuitive for users to navigate themselves around with, while also being very memorable and boldly expressive, so your websites will always look and feel precisely the way you wish them to. Marquez is extremely customizable with minimal effort and no coding required at any point, thought should you want to get into some coding, Marquez is developer friendly and easily editable at the code level. 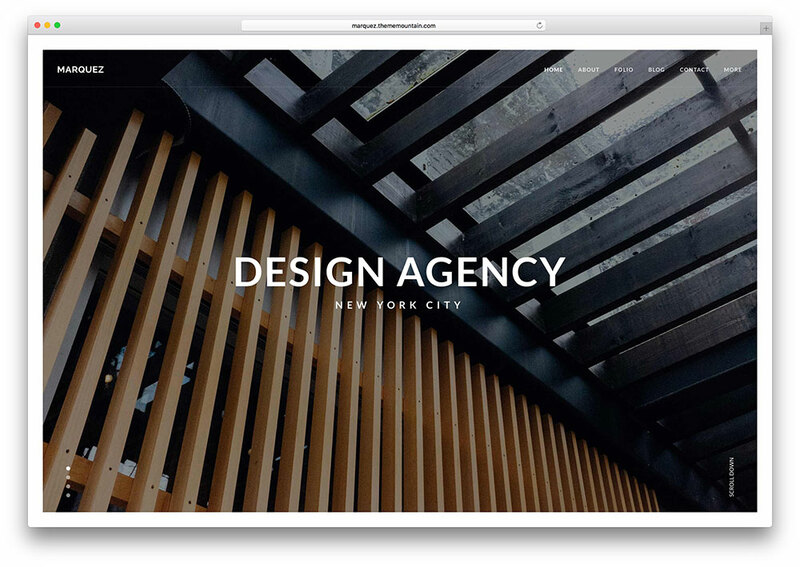 Exa is a visually fresh and very clean, aesthetically unblemished and extremely polished, sophisticated and highly well structured, amazingly flexible and surprisingly functional, deeply graphically thought out and entirely expansive responsive HTML5 creative portfolio template. It is a powerful and extraordinary template that is jam-packed with boldly expressive, creatively open and accessible and very easy to customize features, widgets, elements and plugins that have been carefully coordinated to form a cohesive, powerful whole. Exa has been specifically designed to cater to the specific needs of creative minded professionals and individuals across a wide set of fields and industries, from digital marketing agencies to creative consultancy agencies, fledging new startups and individual freelancers—if you are looking to show off your professional or personal portfolio in a flawlessly stylish and modern minimalist presentation filled with sophisticated HTML5 functionality and smooth CSS3 animations, Exa is your template, packed with useful, convenient and beautifully designed page templates for you to quickly and effortlessly churn out search engine optimized, responsive websites within minutes, out of the box. Exa websites are developer friendly and inherently cross compatible with a boundless range of devices, platforms and screen sizes, maximizing your audience and impact. Make your mark, with Exa! Definity is a highly polished, very technologically sophisticated, visually expansive and professionally graphically designed, consistently impressive and boldly elegant, functional and feature-rich responsive HTML5 single and multipage multipurpose website template, a beautiful and versatile template that packs the raw power and sheer pliability to easily lend itself to a host of different website applications with relative ease and speed. 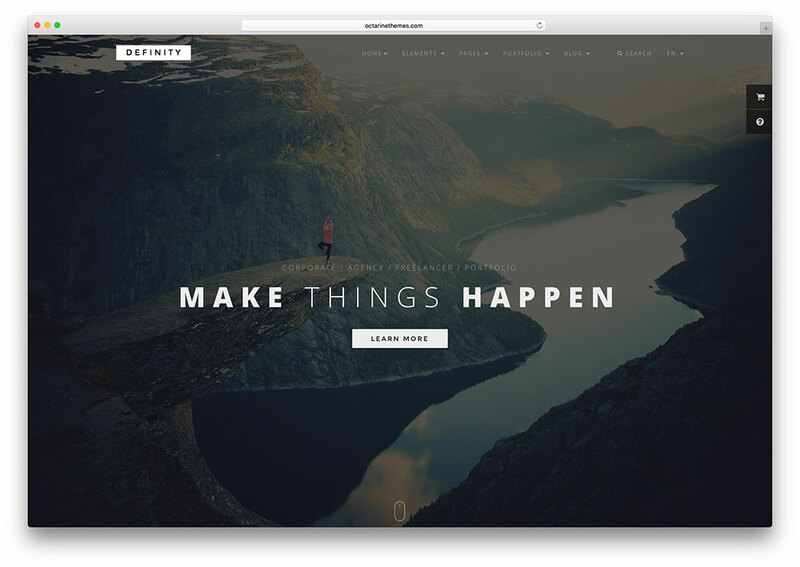 Definity is a handsome and flexible integration of the most cutting-edge technologies available, built on a solid and reliable HTML5 framework supporting a Bootstrap 3 codebases and presented through dynamic SASS CSS3 with smoothly animated visual elements. Definity includes a ton of useful, time-saving shortcodes to simplify the website building process greatly, while incorporating a modular design, minimalist aesthetics, out of the box Working Contact Form and MailChimp integration, and a slew of convenient demo websites and fully preconfigured page templates for all sorts of useful applications, ranging from corporate to portfolio, from blog to photography and much more. Definity is a truly all-inclusive one-stop shop solution for your modern, minimalist looking website needs. Definity is also extremely developer friendly, with a modular codebase that is both extensively commented and highly legible, allowing for seamless modification to suit your needs. Feel Definity’s power today! Volar is a wonderfully visually expressive, amazingly clean and fresh-faced, endlessly pliable and flexible, impressively functional and full-featured, technologically accomplished and aesthetically polished responsive HTML5 single page minimal Parallax website template. 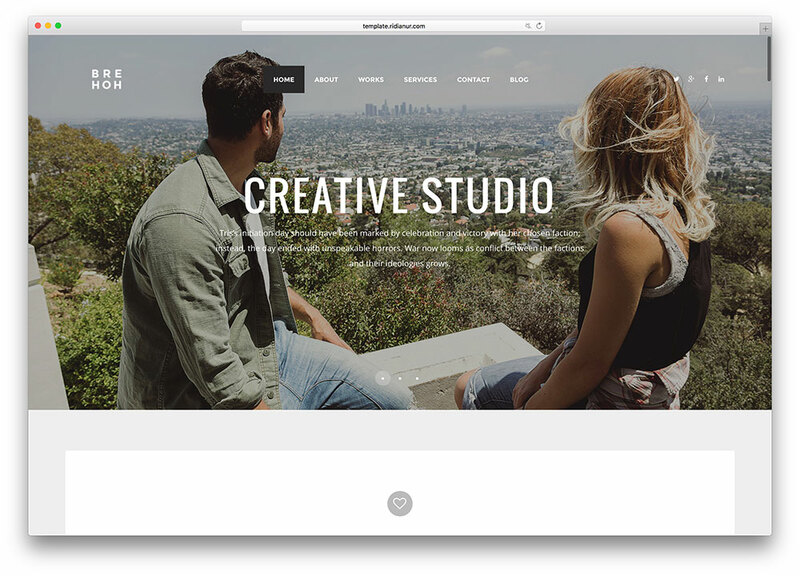 It is a gorgeous and extremely customizable website template that has been built to be an all-around inclusive solution for webmasters of any skill level to easily and effortlessly churn out beautiful, modern and powerful one page websites. Volar is built on top of a solid HTML5 foundation, with gorgeous LESS CSS3 stylesheets, a modular Bootstrap 3 design and a clean and minimal visual design greatly augmented by smooth and gorgeous Parallax visual effects. Volar is jam-packed with convenient and fully fleshed out demo websites for all manners of applications, allowing you to hit the ground running with setting up your own modern single page website. Volar supports powerful HTML5 effects, including local and YouTube HTML5 Video Backgrounds, with extensive cross-browser compatibility as well as total mobile browser compatibility owing to Bootstrap native responsiveness, as well as smooth scrolling and fifteen predesigned skins, which you can easily customize to produce your own unique, personal and identifiable look to suit your visual identity. Let your website take off, with Volar! 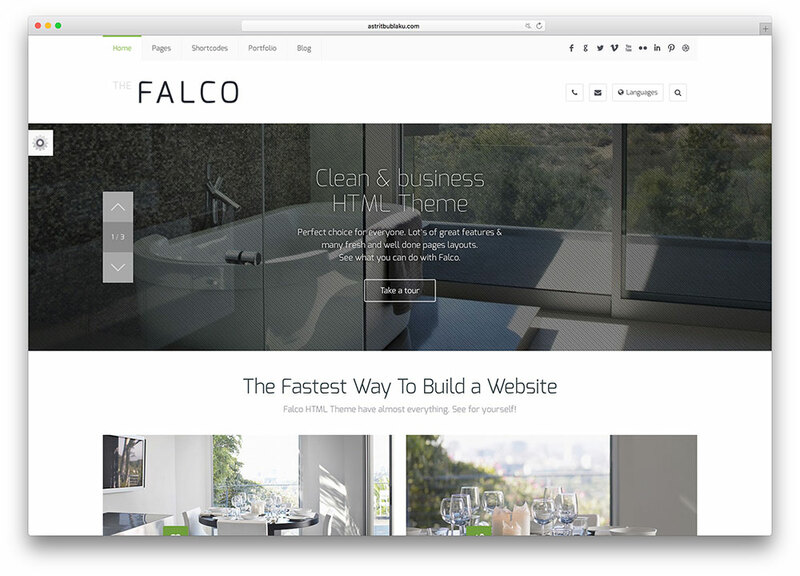 Falco is an amazingly versatile and shapeshifting, visually simplified, clean and minimalist, aesthetically modern and businesslike, technologically spotless and well polished, wonderfully functional and highly reliable responsive HTML5 multipurpose website template. 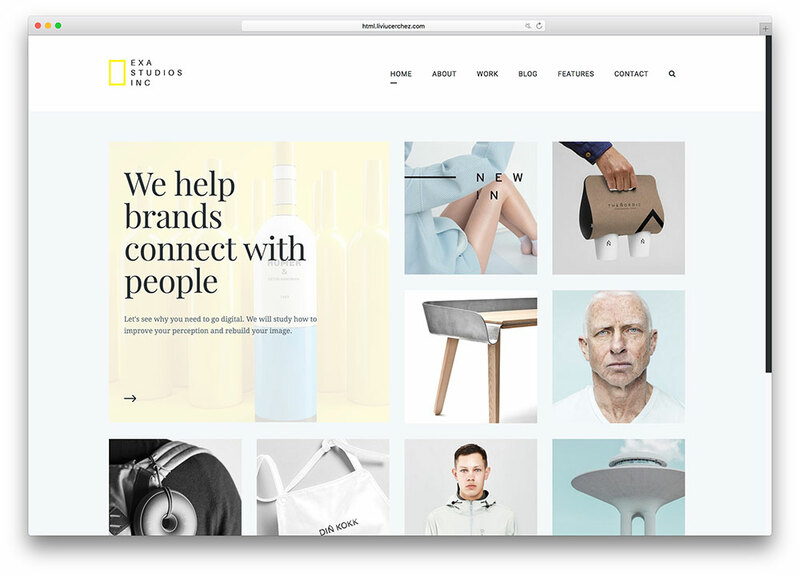 It is an incredibly well designed and highly developed template that packs the strength required to meet the demands and needs of a whole slew of different website archetypes, seamlessly adapting itself to every situation with its trademark simplified, clean design. Falco is endlessly vibrant and colorful, filled with customization options and possibilities, and it includes a convenient set of three Home demo websites, four different color skins, a Working Contact Form and a whopping 60 sophisticated HTML5 page templates included, which can be easily deployed upon a host of different situations and customized to no end to match your website’s needs. Webmasters of all skill levels will find Falco a lovely and highly modifiable tool, with visually impressive Vertical and Revolution Sliders. Falco includes amazing CSS3 animations and smooth transitions, with beautiful and gorgeous Google Maps functionality out of the box and Retina-ready graphical elements at your disposal. Falco is extensively documented and thoroughly annotated, so you can be sure to make the most out of Falco by exploring the vast amounts of information already available to you. Oshine is a wholly spectacular, amazingly creative and unique, functionally vast and incredibly expansive, technologically sophisticated and considerably powerful, professionally graphically designed and very well structured responsive HTML5 creative multipurpose website template, a potent and resourceful website template that packs all the tools and features required to orchestrate successful and functional websites across a wide set of fields and industries. Oshine has been packaged with a host of incredibly diverse, convenient and useful fully fleshed out demo websites, totaling in at over 18, all of which have been decked out with their own exclusive internal webpages for completely full-featuredness. Oshine packs a whopping 150 total HTML5 pages and files, all of which are incredibly easy to customize and bend to your every need. Oshine is wonderfully pliable in that regard, and its conceptually multi-layered graphical resources will perfectly suit websites that need smooth visual transitions and that are heavy on content and still need to be easy on the eyes and stunning. Oshine is perfect for graphic designers, freelancers, corporate and business websites, professionals firms and agencies of all sorts of creative enterprises. With its minimalist and modular Bootstrap design, Oshine is always developer friendly and 100% responsive across all devices, browsers and screen sizes. Shine with Oshine! Cake is a deliciously designed, wonderfully pliable, incredibly visually refined and aesthetically minimalist, conceptually unique and functionally polished, deeply resourceful and technologically modern responsive HTML5 multipurpose website template, an entirely gorgeous website template featuring a cohesive and coherent graphic design that is rich in features and totally sweet. Cake has been designed to allow webmasters of any skill level to build the tastiest and most appealing websites with a finished, professional touch and several readymade skins, seven different Homepage demos and over 70 preconfigured, professionally designed HTML5 template pages that incorporate the most amazing and smoothest CSS3 transitions and animations for ultimate visual sophistication and heightened user engagement. Cake has a clean, minimalist visual design that is intuitive and highly accessible, so users can easily find their way around your website, with tons of Retina-ready custom icons and graphics ready for deployment as inline fonts as well as numerous Google Fonts readily available out of the box. 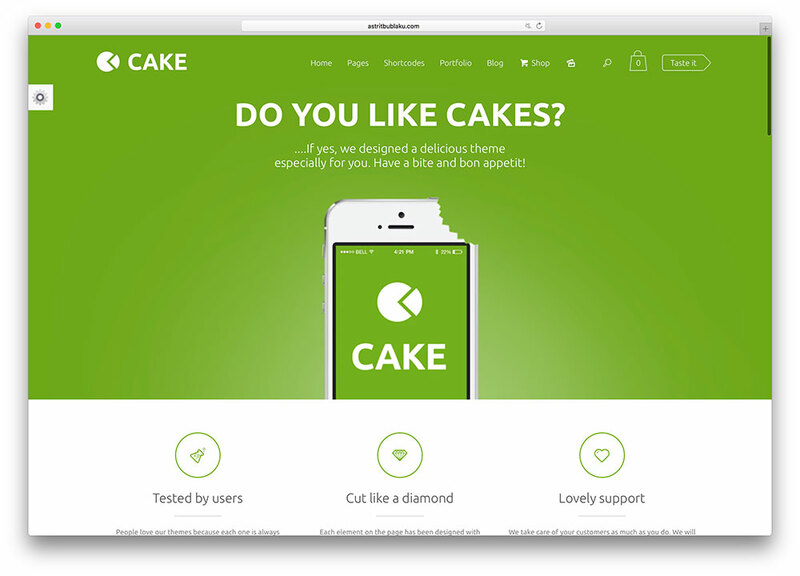 Cake is very easy to customize to suit your desired look and feel, with tons of advanced options available at your fingertips, and every Cake website is natively responsive, cross-compatible with all devices, browsers or screen sizes on the planet. Have a slice of Cake! 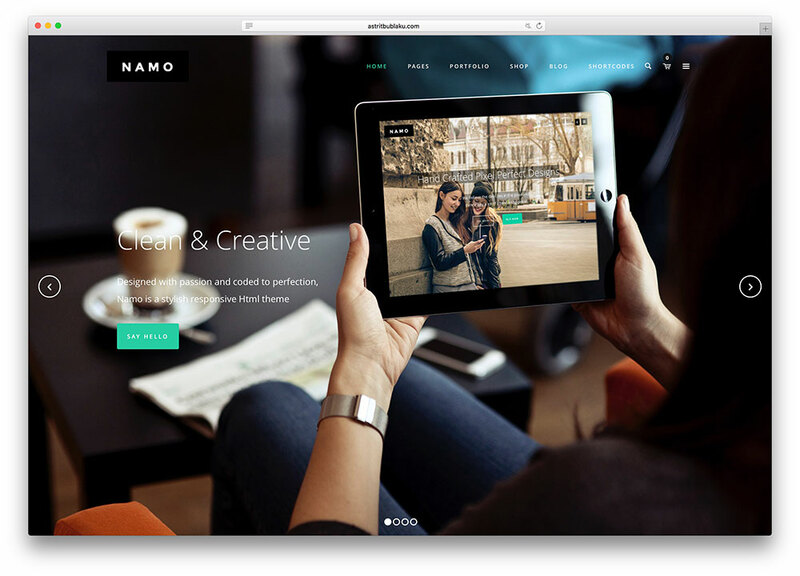 NAMO is a clean and sophisticated, elegant and visually refined, aesthetically minimalist and conceptually creative and flexible, technologically proficient and deeply resourceful, highly functional and feature-dense, smooth and intuitive responsive HTML5 creative multipurpose website template. It is an all-around solid and reliable toolkit that has been created with the utmost care and attention to detail in order to produce a powerful package that can muscle the demands of websites across the board, empowering webmasters with or without coding skills to easily churn out polished and professional looking, minimalist and functional websites in minutes, out of the box. To pull this off, NAMO incorporates four different fully fledged-out demo websites and over 80 readymade, highly customizable HTML5 webpage templates, styled in gorgeous, stunning dynamic CSS3 technology and built on a reliable Bootstrap 3 modular design on top of an HTML5 framework that is sufficiently powerful to effortlessly deploy sophisticated shortcodes and plugins like sliders and layouts to gorgeous effect. NAMO has also been built to be search engine optimized out of the box, so your website will easily climb the relevant ranks, as well as being natively responsive, making it cross-compatible with all browsers, devices and platforms the world over. Try NAMO today! 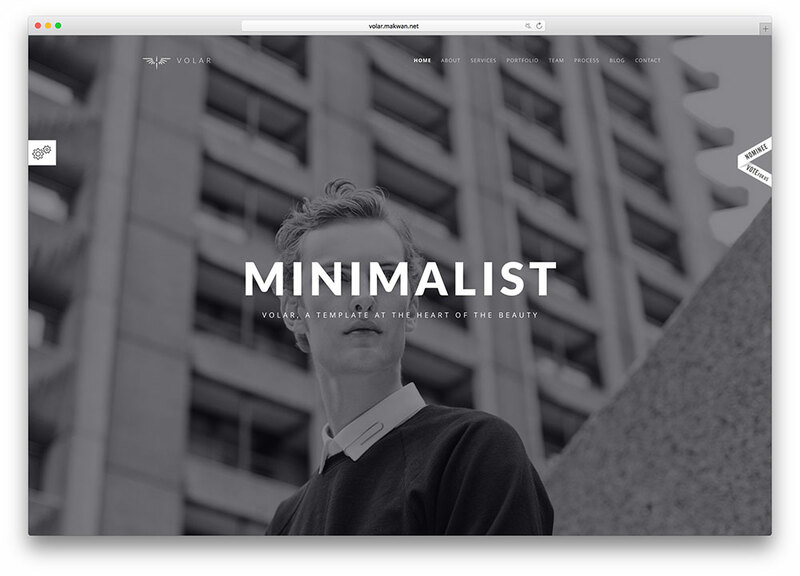 If you are looking for minimal WordPress themes instead of HTML templates you might want to check this versatile theme collection. WordPress will help you to manage content on your website without touching or writing a single line of code. All tasks you will be able to get done via WordPress dashboard which is famous for its simplicity and user friendliness.